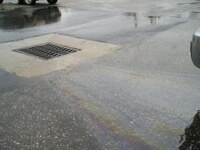 Urban Runoff Oil, grease, gasoline, radiator fluid, detergents, sediment, trash, and other chemicals are examples of “urban runoff.” These toxins accumulate on the surface of streets, parking lots, driveways, and other impervious surfaces. These pollutants will eventually drain into a stream, river, wetland, or lake and will cause harm to the aquatic ecosystem and possibly to the health of the community. 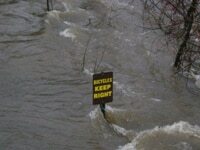 Frequent Flooding An increase in impervious surfaces prevents water from being absorbed into the ground. 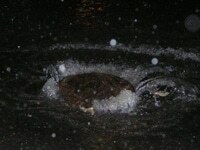 When it rains, water makes its way through the storm sewer system to a nearby waterway. 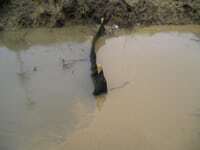 This often creates flash floods which can destroy homes and other structures located near the stream. Combined Sewer Overflow (CSO) CSOs are sewer systems that accept both sewage and stormwater simultaneously. During heavy precipitation events, these systems cannot properly route water to wastewater treatment stations. In this instance, a combination of stormwater and raw sewage backs up within the piping system and is forced out by pressure, either through manholes in the streets or into basements. Construction Sites Improperly installed erosion and sediment control devices, like this ditch check dam, do little to prevent huge amounts of construction site sediment from entering waterways. Impacted Headwater Streams Headwater streams are the feeder streams for the larger water bodies within a watershed. These waterways, if highly disturbed, have detrimental effects on the larger river that they flow into. 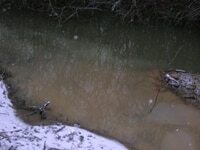 Many local regulations do not protect against degradation of these small creeks. The cumulative effect of destructive activities on these tributaries cause alarming problems downstream.This photograph represents a stretch of stream that has been completely destroyed for the development of land for a home. Sediment Sediment is the leading polluting agent for surface water in the United States. Construction and other earth-disturbing activities are the main cause of this problem. Lack of properly installed environmental controls and poor enforcement have led many streams to be severely damaged. Threatened Wetlands Wetlands are referred to as “Nature’s Kidney.” They treat polluted waters by removing toxins through absorption by vegetation. 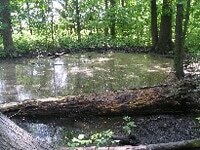 Wetlands also trap pollutants within the soil located at their bottom. They function as our kidneys do by detoxifying what passes through them. Wetlands also provide habitat for many species of reptiles, amphibians, birds, and mammals, and have been found to reduce mosquito populations. 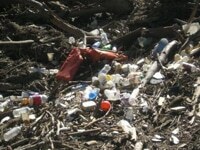 Litter Litter is the most visible type of pollution. Cigarette butts, bottles, styrofoam, wrappers, cans, and plastics are commonly found on the sides of streets, in streams, and almost any other place you look. Litter prevention and clean-up programs are great ways to address this problem. However, enforcement is needed to be effective in deterring littering.